Introduction: Oxidative stress in the brain causes nervous system impairment. Hence the use of antioxidants could be an effective approach to prevent disorders such as anxiety. Plants containing phenolic constituents are reported to be potent antioxidants. Brassica oleracea L. commonly known as broccoli, is rich in phenolics mainly flavonoids and possesses excellent antioxidant property, however its anxiolytic potential has not been investigated. Thus in the present study antianxiety activity of extracts of broccoli was evaluated in experimental animals. Materials and Methods: Various pharmacognostic parameters of the plant material were studied following standard procedures. Groups of six mice each were taken as different treatment groups. Control group received vehicle (1% Carboxy Methyl Cellulose), positive control received Diazepam (2mg/kg) as standard drug while test groups received petroleum ether and hydroalcoholic extracts (50, 100 and 200 mg/kg body weight, p.o.). The effects were evaluated on Elevated Plus Maze (EPM), hole board and mirror chamber tests. Statistical analysis was performed using ANOVA, followed by Turkey’s post-hoc test. Results: Hydroalcoholic extract shows dose dependent increase in the average time spent and frequency of entries in the open arms of the EPM; decreased latency, increased time spent and frequency of entries in the mirror chamber; increased number of head dips in hole board test as compared to control was observed. These effects were comparable to the effect produced by diazepam. Phytochemical screening of the bioactive extract revealed the presence of alkaloids, phenols, flavonoids and tannins. Conclusion: From our study, it can be concluded that hydroalcoholic extract of Brassica oleracea at the dose of 200 mg/kg possesses marked anxiolytic activity. Kaur D, Shri R, Kamboj A. 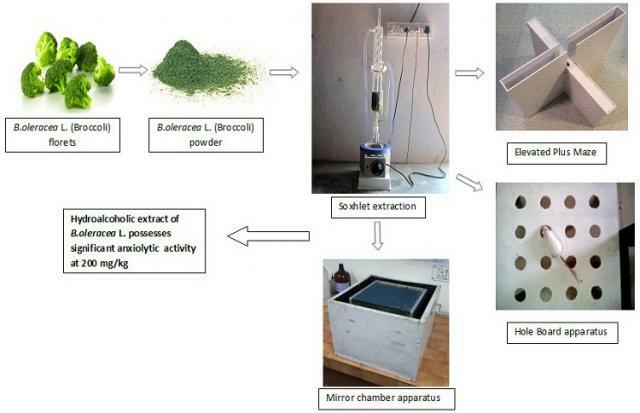 Evaluation of Anti-Anxiety Effect of Brassica oleracea L. Extracts in Experimental Animals. Pharmacognosy Journal. 2017;9(5):638-643.